Trading in or Selling Your Current iPad/iPad 2? Make Sure its Wiped Clean! 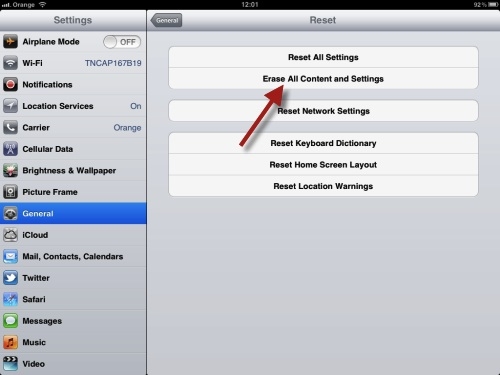 "There are two ways to erase an iPad. There's the right way and the wrong way." As you can see from the screen shot above, the right way is pretty straightforward. Go to Settings, then General, and click on the "Erase All Content and Settings" button. Then turn it back on and make sure that it has been reset. Simple. The wrong way is to do it through iTunes, since you don't want to corrupt or change your current content file. Otherwise you won't be able to put your stuff onto your new iPad 3, or HD, or whatever they will be calling it.